With continued iPhone growth and a particularly strong performance from its iTunes and services businesses, Apple posted a slight increase in revenues in the June quarter, though lower margins led to a 20 percent slide in profit. Following the company's earnings release, Apple executives took part in a conference call to discuss the quarter, and notes of interest follow. 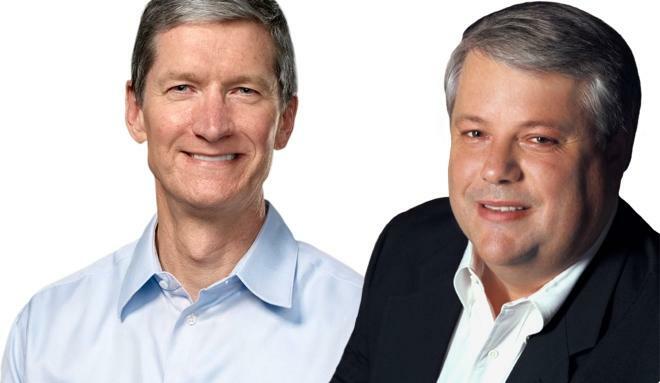 Participating in Tuesday's call were Apple Chief Executive Tim Cook and Chief Financial Officer Peter Oppenheimer. Among major hardware, Apple's only growth came from the iPhone, which saw a 20 percent jump to 31.2 million units. iTunes, software and services were particularly strong in the June quarter, growing 25 percent. iPad shipments had a tough comparison to Q3 2012, when Apple launched the third-generation iPad late in the preceding quarter. The iPhone was Apple's only major growth product for Apple during the quarter, posting a 20 percent increase in shipments from the same period in 2012 to 31.2 million units, and setting a new record for the quarter. Increase of 5.2 million. iPhone sell-through of about 31.8 million units. Revenue from the iPhone was also up 15 percent year over year. Developed and emerging markets  US, UK, Japan, Brazil, Russia, India, Thailand  saw strong sales. iPhone 5 most popular so far, but solid sales for 4 and 4S. Ended quarter with 11 million in channel inventory. iPhone sales strong in Japan, top-selling smartphone in Japan. Apple No. 1 or No. 2 smartphone manufacturer in North America, Western Europe, Russia, Turkey, Singapore, Hong Kong. 90 percent loyalty rate among iPhone owners. iPhone top spot in cust.sat. from JD Power, South Korea. American Airlines, Cisco, General Electric, SAP deployed more than 20,000 iPhones across their enterprises. iPad shipments saw their first-ever year over year decrease, down 14 percent to 14.6 million units. Revenues for the iPad lineup were off even more, sliding 27 percent due to the late 2012 introduction of the lower-margin iPad mini. Exited quarter with 4.1M units of iPad channel inventory. iPad number one in 2013 tablet satisfaction survey. Cites Chitika study showing iPad at highest level of usage this year with 84 percent web share in North America. Mac shipments slid 7 percent during Apple's third fiscal quarter of 2013 to 3.8 million. Revenue wasn't hit as hard, though, easing just 1 percent. 3.8 million Macs, 7 percent decline YoY but higher sales than Apple's estimates. Global computer market contracted 11 percent in same time, so Macs gained share. Developer preview of OS X Mavericks will bring more than 200 new features. "We're extremely pleased to have received" authorization to roll out 660,000 iPads to Los Angeles students. Apple saw huge growth in its iTunes, software and services businesses, surging 25 percent year over year to $3.9 billion in revenue. Retail sales were flat year over year. The company saw the biggest regional growth in Japan, where revenue was up 27 percent from the same quarter in 2012. Sales were also up 12 percent in the Americas, while the rest of the world saw year over year decreases. Revenue for quarter $4.1 billion. Strong growth in iPhone sales. Most successful macBook Air launch to date. Ended quarter with 408 stores, 156 outside the United STates. Will open 9 new stores in next quarter. 23 more such relocations in Fiscal '13. Retail segment income was $670 million. 15,000 visitors per store, per week. iPod shipments were down a dismal 32 percent year over year to 4.6 million units. The iPod number wasn't even mentioned in the text of Apple's press release  an uncharacteristic decision. Revenue from iPod sales was also down 31 percent year over year. Why product cycle might be different: "We are on track to have a very busy fall. I would like to leave it there and go into more detail in October." Cook: From a growth point of view, we're Apple. Our growth will come from new services and products... In addition to this we have opportunities and channels... retail stores, carrier relationships. Cook: I don't subscribe to [notion that] higher end of the smartphone market has hit its peak. Cook on iPad: If you look year over year we had a 2.4 million unit decline, but 80 percent of that came just from changes in channel inventory... The underlying sell-through declined by just three percent. The most recent data I've got is that the iPad web share data shows that through the quarter we accelerated further and the iPad now accounts for 84 percent of web traffic... If there are other tablets being sold, I don't know what they're being used for. We feel really good about where we are. We had an incredible quarter in US education. Oppenheimer: Sequential decline in gross margin was not a surprise to us. As I said last quarter during the call, we expected gross margin to be down. We had some puts and takes in the quarter, but we ultimately ended up in the range that we thought we would be, and at the high end. Oppenheimer: We were down four percent year over year in ASP, about $27. That's primarily due to the mix of products we're selling. iPhone 4 sales accelerated as we offered more affordable options in emerging markets. Sequentially it was down about $32, and that was driven by mix as well. India up 400 percent, Turkey and Poland up over 60 percent. We also saw very strong iPhone sales in some developed markets. China: China was weaker in the quarter. The data sheet focuses on revenue, and it doesn't tell the complete story. If you look at sell-through, the sell-through in China was only down four percent from the year ago quarter when normalized for channel inventory. Mainland China was up five percent year over year. That's a lower growth rate than we've been seeing, and I attribute that to many things. The economy there clearly doesn't help us and others. Hong Kong... we saw a more dramatic downturn there, and it's not exactly clear [why]. Cook: We haven't announced anything relative to a trade-in program, so what you've seen is primarily rumor-oriented. The reason that it is so attractive around an iPhone is that the residual value of an iPhone stays so high. That makes the trade-in programs a win-win from many points of view. But we haven't announced anything. I'm not opposed to it... I like the environmental aspect of it. I think it's important to put it in perspective. In greater China, our revenues were $4.9 billion for the quarter, about 14 percent of the company. A few years ago, that would have been hundreds of millions. In the last 12 months we've done $27 billion on a trailing basis. It's a huge business for us. iPad sell-through in greater China was up 8 percent, in mainland China up 37 percent. In the tablet market, latest figures indicate higher than 50 percent share in China. We now have about half a million developers in China working on iOS apps. That's up over 70 percent year over year. We're going to double the number of retail stores in China over the next two years. iPad and iPhone sales are currently lower than where we want and need them to be. I continue to believe in the arc of time that China is a huge opportunity for Apple. I don't get discouraged over a 90 day cycle that could have economic factors. Cook: What we've seen is that the number of first-time smartphone buyers the iPhone 4 is attracting is very attractive. We saw this beginning to happen toward the end of the Q2 timeframe. We offered the more affordable pricing on a wider basis this quarter. Where iPhone 5 continues to be the most popular iPhone product by far, we're happy to have the [iPhone 4 available to first time smartphone buyers]. There's always more weapons [than the iPhone 4]; we have more than one tool in the toolbox. "We'll see," on new product categories. "we're working on some things we're really proud of, and we'll announce some things when we're ready." Cook: I would classify [carrier partnerships] as being good. The press coverage I've seen with Russia probably need some color. The articles I've seen suggest that we're not selling iPhones through carriers. If you look at Russia... 80 percent of smartphone sales are through retail. We're happy with how we're doing there. We're continually looking for other [carrier] relationships to both add and enhance the ones we've got. NAND pricing is fairly stable and is following seasonal prices as we'd expect. Expect further price reductions in LCDs. "The way I think about it is: We're here to make great products. We think that if we focus on that and we do it very well, the [financial aspects will follow]." "We believe that the most important thing is that the customer LOVE the products. LOVE them. If you don't start at that level, you run the risk of making something people don't want." We don't project ASP. We do give guidance, we have an assumption on ASP. We saw significant growth in the lower price point year over year, which for us is the iPhone 4, which is still a great product. That was one of the things along with the iPhone 5 doing well that allowed us to beat many of the expectations for iPhone sales. Cook: It is very important, it is a part of the ecosystem. Just like iTunes, the App Store are part of the ecosystem... having something in the automobile is very, very important. It's something that people want, and i think that Apple can do this in a very unique way.